I will briefly introduce the main robotic systems I've worked with. This is a ground robot developed for Urban Search and Rescue operation within the NIFTi European project. It was designed and built by Bluebotics and is now available under the name of Absolem. Six of them are in use by different partners of the consortium: Bluebotics in Lausanne, the Language Technology Lab of DFKI in Saarbrücken, TNO in Soesterberg, the Center for Machine Perception of CTU in Prague, the ALCOR lab of La Sapienza in Rome, and the Autonomous Systems Lab of ETH Zurich. 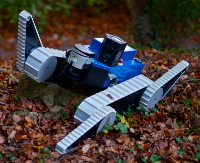 It has two tracks linked by a differential and four flippers to maneuver in rough terrain. It is able to climb stairs and slopes up to 45º. Nifti is equipped with a Sick LMS151 laser sensor mounted so as to roll back and forth and produce 3D point clouds. There is also a Point Grey Ladybug 3 omnidirectional camera. I developed a big part of the software architecture in ROS, used to control and exploit the robot. 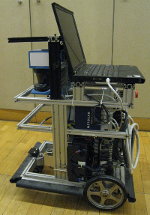 Biba is an indoor ground robot developed within the BIBA European project. It is designed as a generic experimental platform for indoor environments. It mainly features a SICK LMS200 2D laser scanner for mapping, obstacle avoidance, and navigation. Its structure with aluminum profiles offers plenty of opportunities to mount additional sensors such as omnidirectional or RGB-D cameras. I participated in the development of the ROS interface and tools to control the robot, as well as in the system maintenance. I've been involved in projects with many other robots. rezero: I was one of the main supervisors of this focus project. e-puck and marXbot: as demonstration platforms for the behaviour learning research. plantobot: I was one of the main supervisors of this artistic project. lizhbeth: I collaborated on the state estimation. Pioneer P3-DX and P3-AT: as test platforms for indoor or outdoor applications.